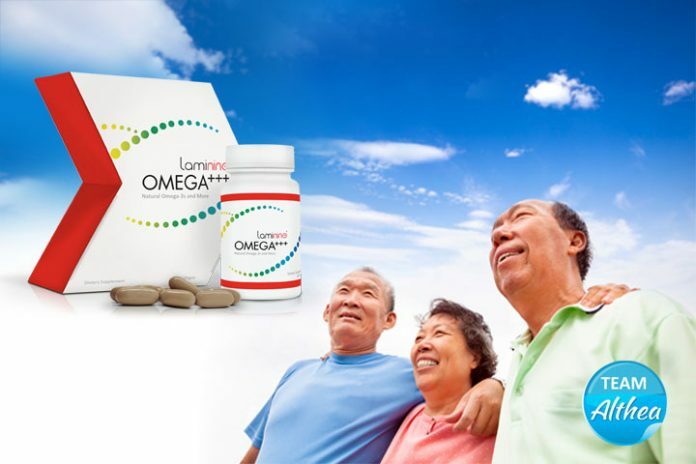 Laminine OMEGA+++ is a supplement for Laminine original formula. It contains a good amount of omega fatty acids and other ingredients integrated to help improve health functions in relation to pliable arteries and blood vessels, increased agility, and support to balanced cholesterol levels. Laminine Omega+++ is a blend of high-quality omega fatty Acids 3 (EPA and DHA), 6, 9 and combined with CoQ10 Extended-Release with Fertilized Avian Egg Extract (FAEE). It also has Vitamin K2 components from organic and natural sources making it tough to beat. It contains smaller amounts of FAEE because it is designed for the heart and bones and is best taken with Laminine that contains the full amount of FAEE. Omega-3s help maintain normal levels of HDL (“good” cholesterol) and LDL (“bad” cholesterol), which keeps excess cholesterol from building up. Vitamin K2 helps to direct calcium to the bones and teeth, keeping it away from arteries of the heart. A study of Yup’ik Eskimos in Alaska, who on average consume 20 times more omega-3 fats from fish than most Americans shows that a high intake fish helps prevent chronic diseases such as diabetes and heart disease, even though obesity was prevalent among them. The study, led by researchers at Fred Hutchinson Cancer Research Center together with the Center for Alaska Native Health Research, found that obese persons (among the Yup’ik Eskimos) with high levels of omega-3 fats had triglyceride and CRP concentrations did not differ from those of normal-weight persons. It appeared that high intakes of omega-3-rich seafood protected Yup’ik Eskimos from some of the harmful effects of obesity,” says lead author Zeina Makhoul, Ph.D.
Low levels of DHA and EPA and those who are obese have increased blood triglycerides and C-reactive protein, or CRP (a measure of overall body inflammation). An elevated level of triglycerides and CRP increase the risk of heart disease and, possibly, diabetes. Including fish in your diet is a must. Your body can’t make omega-3 fatty acids. So you need to get them from your diet. If you are not fond of eating fish daily, this supplement has the perfect blend for a healthy heart, eyes, and bones.